This week was off to a blustery start, with chilly temperatures and flurries in the air – not quite what we were hoping for, but we’re making it work! Our to-do list for the week is already growing, but there are two items in particular that we thought you’d be interested in. First up is our rhubarb – one of our earliest crops! Rhubarb typically springs into season during the first week in May, alongside its skinny green counterpart asparagus. This year, though, we’re doing a little experiment. In hopes of getting our hands on some rhubarb even earlier, we’ve tunneled 5 rows of rhubarb. Tunnels are a technique used for several of our other crops, including our famous melons. A tunnel is basically a mini in-field greenhouse. They’re constructed by placing small metal hoops in the ground, evenly spaced apart. These hoops are then covered with sheets of clear plastic dotted with holes: the plastic helps trap heat in the soil, speeding up the growing process and the holes in the plastic allow for temperature moderation and air circulation. Rhubarb is a spring crop, as most of you know. And that’s not just because we love to eat rhubarb crisp during the month of May (although this is a true statement!). It’s also because rhubarb plants don’t like heat. Once the temperature consistently climbs above 30⁰C, the plants begin to complain and we stop harvesting. That being said, we’ll need to carefully monitor these tunnels, and be careful that they don’t work too effectively, and raise the temperature too high. Overall, our goal with these tunnels is to end up with rhubarb in our hands approximately 5 – 10 days earlier than past years. Fingers crossed! 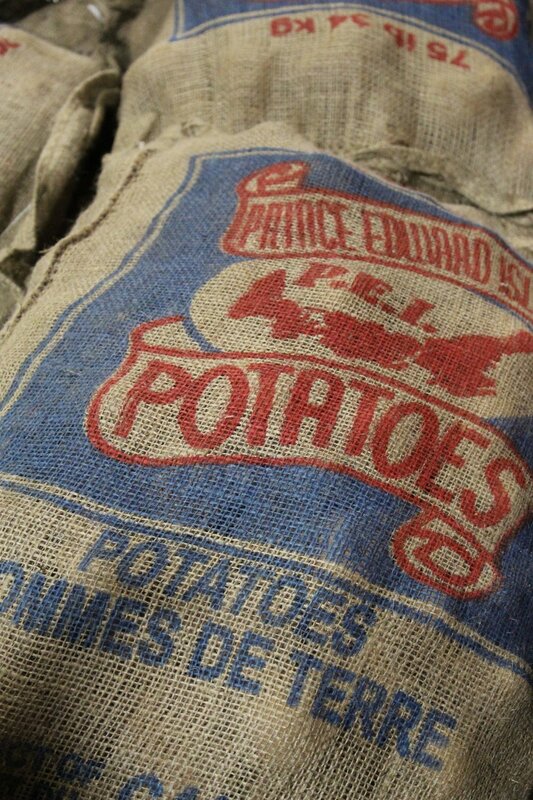 The next item on our to-do list reminds us of a favourite childhood song… “It’s Bud the Spud from the bright red mud, goin’ down the highway smiling…” You guessed it; we’re talking about potatoes! This week we hope to plant our 2019 crop of potatoes. And did you know that potatoes aren’t actually planted from seed? Rather, they’re planted from other potatoes, called seeding potatoes. At least, if you want to get the same variety of potato, that’s how its done. Potatoes do produce seeds, but if you plant those, you’ll end up with a whole new variety. To ensure consistency, and get the same potato from year to year, you plant another potato! Our seeding potatoes just arrived, all the way from the East Coast, and we’re getting ready to pop them in the ground. To do so, we typically cut the potatoes in half, ensuring that at least one ‘eye’ remains intact. It’s from these eyes that the rest of the plant will grow. Have you ever forgotten about a bag of potatoes and opened it up to find little alien-like sprouts climbing up towards you? It may be startling at first, but this is actually just what you want if you’re growing your own. Want to learn a little bit more about potatoes? We’ve got a few more fun facts for you, so keep on reading! Okay, so potatoes grow under the ground, which makes them a root vegetable, right? …not quite! Potatoes are actually a tuber, which means that rather than sucking up nutrients from the soil and delivering them to the rest of the plant, they store up the nutrients. That’s what makes potatoes so fat and starchy. Another question we often get is “What about green potatoes?! Aren’t they poisonous?” When planting potatoes, we have to make sure they’re deep enough that they aren’t exposed to light. Sunlight causes a chemical called solanine to build up and turn the potatoes green. Solanine is technically poisonous, but you’d have to eat a whole bunch of green potatoes for it to actually make you sick! So, next time you see a green potato, just slice off the green part and keep on cooking. After planting the potatoes, we’ll need to hunker down and wait until early June until we can start to harvest. By then, tender and sweet baby potatoes should be ready for digging! We won’t dig up our whole crop then, though. We’ll stagger our harvesting, allowing the potatoes to slowly grow larger throughout the season. By fall, the potatoes will be big enough and sturdy enough for storing through the winter. Let’s not get ahead of ourselves, though – we’re still waiting for spring! Well, that’s it for this week! Stay tuned for updates on our rhubarb & potato crops. Thanks for reading!